Island, will take place on Saturday November 11th, 2017 from 11:00 am - 4:00 pm. at Etiwan Park. 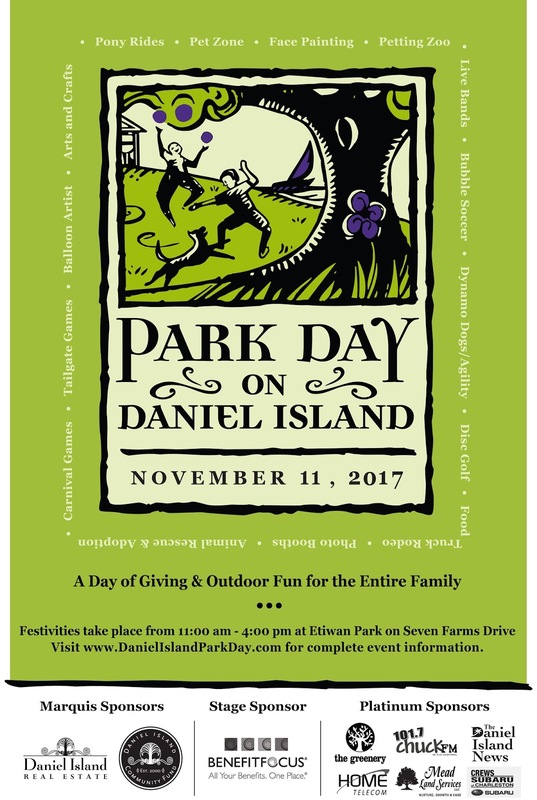 A fall tradition in the Lowcountry, Park Day is a day of outdoor family fun for all ages that showcases and supports a diverse range of local charitable organizations. In addition to live entertainment, games, jump castles, animal exhibits and other favorite activities, this year’s festival will also feature a Food Truck Rodeo, a sports pub tent including Big Screen TV's to watch all of your favorite college football games and much, much more. The event will take place from 11:00 am until 4:00 pm at Etiwan Park, located on Seven Farms Drive, across the street from the Bishop England High School on Daniel Island. See you at Park Day, and don't forget to tag your photos of the event on Instagram using the hashtag #diparkday! Note - there is no reschedule date for this event. ©2010 Daniel Island Company. Picture Window theme. Powered by Blogger.